A donation of securities or mutual fund shares is the most efficient way to give charitably. 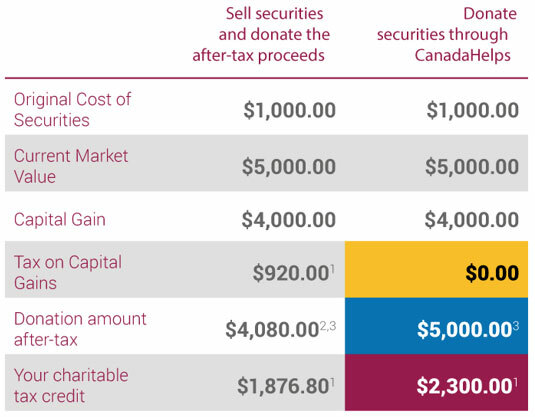 We’re the largest processor of online security and mutual fund donations in Canada. And, we make it easy to disburse your donation across multiple charities. Here are some approximate figures to illustrate. This assumes a 46% marginal tax rate. For calculating capital gains tax, this rate is applied to 50% of the capital gain. $4,080.00 represents the full value of $5,000.00 minus estimated tax of $920.00.